The long-debated changes to America's tax code are now law. President Trump closed out 2017 by signing the Tax Cuts and Jobs Act, bringing sweeping changes to how much individuals and companies will pay in tax beginning this year. What does the new tax law mean for you? Here are some key take-aways. There's been a lot of debate about who benefits the most from the new tax law, but what's clear is that just about everyone will see at least some decrease in how much they pay. At the very least, your personal tax bracket is likely lower. The new tax brackets are: 10 percent, 12 percent, 22 percent, 24 percent, 32 percent, 35 percent, and 37 percent. (They were previously 10 percent, 15 percent, 25 percent, 28 percent, 33 percent, 35 percent, and 39.6 percent). A tax reform calculator can help you grasp how much tax you'll pay under the new law. The new tax law greatly simplifies and lowers taxes for companies. Corporations will now pay a flat rate of 21 percent on all profits, down from as much as 35 percent under the previous law. This brings the United States' corporate tax rate below the global average. The new law also eliminates the alternative minimum tax (AMT) for corporations. One of the final provisions added to the new tax bill was an increase in the child tax credit. This is a credit you receive if you have a dependent aged 17 or under. The credit was doubled, from $1,000 to $2,000 per child. The refundable portion of the credit was also increased to $1,400. There was some debate in Congress about whether property taxes, state taxes, and local taxes would be deductible, and they ultimately will be. However, these deductions will be capped at $10,000. This could mean higher taxes for those people living in certain places, such as California and New York. Some state and local lawmakers are exploring ways to offset that burden. Under past tax law, you could deduct moving expenses from your taxes. You could deduct many work-related expenses that were not reimbursed from your employer. You could even deduct any costs you incurred when you did your taxes. These deductions and many others are gone. However, it is unclear whether taxpayers will feel the need to itemize deductions in the future anyway. As we indicated above, the new tax bill does allow for some itemized deductions, but it may not matter. That's because the standard deduction has been doubled, to $12,000 for single filers, $18,000 for heads of household, and $24,000 for married couples filing jointly. For many people — especially those who don't own homes — it may be hard to collect the amount of deductions to make itemizing worthwhile. The Joint Committee on Taxation said that 94 percent of taxpayers may now choose to take the standard deduction, up from 70 percent under the previous law. Under the previous tax law, the IRS allowed you to reduce your tax liability by claiming a personal exemption. This exemption was $4,050 during the last two years. The new tax law eliminates personal exemptions and instead significantly boosts the standard deduction ($12,000 for singles and $24,000 for married couples). For most people, this still will result in lower taxes. There were some adjustments to how investment income is treated, but dividends and capital gains will generally be taxed as they were under the previous law. Long-term capital gains — investments held for more than a year — will still be taxed at 15 percent for most people and 20 percent for the highest earners. Short-term capital gains will still be taxed as normal income, though that means the taxation will be less, since income tax brackets are lower under the new law. Under the previous tax law, it was possible for people to be stung by higher taxes if they got married. That's because in some instances, a couple with similar incomes filing jointly would jump to a higher tax bracket. Under the new law, the thresholds for filing jointly are exactly double those for single filers, except for married couples earning more than $300,000. Under the Affordable Care Act, anyone who did not purchase health insurance was subject to a penalty of 2.5 percent of your income or $695, whichever was higher. That penalty will go away in 2019 under the new tax law. It's important to know that when you file your tax return over the next few months, you won't be working with the new tax law. Any money you earned in 2017 is taxed under the previous tax structure. This is important to remember when claiming deductions and trying to figure out proper tax rates for your income. 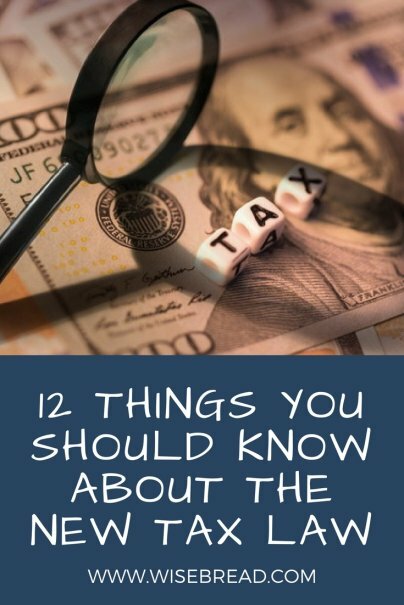 You won't have to worry about the 2018 tax law until you file your tax return in 2019.